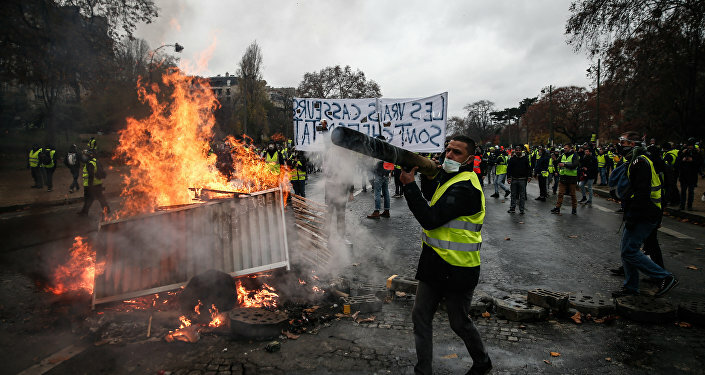 On December 4, French Prime Minister Edouard Philippe said the three fiscal measures, including fuel tax, will be suspended amid violent 'Yellow Vests' protests of the recent days. However, this decision doesn't take fuel tax completely off the table, Jim Shields, Professor of French Politics at the University of Warwick told Sputnik. Sputnik: Did Macron really have any other choice but to back down on the fuel tax issue? Jim Shields: Macron no longer has the option of pressing ahead regardless which is how he has approached his reform agenda so far. This one has stopped him in his tracks. The decision to stop the fuel tax doesn't take it completely off the table — technically it's suspended for six months — but it's as good as dead. Since I can't see how the government would risk the kind of response that would be provoked by its reappearance. The Yellow Vest protestors seem to be welcoming this as a first step only — they want more. For them, this has become a wider issue than a single tax on fuel. It's about taxes in general; rising energy costs, rising prices, falling purchasing power and the struggle many in France say they're having, to make ends meet. Social justice has become the central demand of the protestors and there Macron is not going to be able to provide solutions that will satisfy. So this is not problems solved, far from it. Sputnik: Has Macron moved too fast in trying to push his reforms through — is this the result of that? Jim Shields: Macron has been in his first eighteen months a President in a rush; approaching reforming France like a technocratic project which must run to schedule. Until now he has shown no signs of compromising the pace or direction of his reform agenda and he has pushed through some difficult reforms of the labor market, the tax system, the state railway — all of them opposed but not enough to de-rail them. But Macron is paying the price now for neglecting the social dimension while concentrating on economically liberalizing reforms and he simply didn't correct it in time to avert this crisis. But there's another factor to — to do with Macron's presidential style — which has been lofty, high-handed and dismissive of criticism and dismissive it seemed of the everyday concerns of the French. The steep fall in his poll ratings is explained as much by growing personal antipathy towards Macron as it is by his policy choices. Sputnik: How do you think this incident is going to affect his presidency going forward, is he going to have to re-connect with the French people after this? Jim Shields: This looks like a tipping point in the Macron presidency. Macron said he would not be like previous Presidents who were beaten back by opposition to their program. But it's hard to see how he could proceed now with other controversial reforms like pensions and unemployment insurance without meeting more and more resistance; now that the street has forced him back on the fuel tax. This will embolden opponents and make it harder for Macron to be the kind of President he wants to be and has been for the next eighteen months. He does need to try to reconnect with the French people but the danger is he is already stuck with the label of being a President of the rich; and that label is going to be well-nigh to shift. Nothing in the constitution says a President must resign no matter how unpopular he becomes. But an inability to implement his reform agenda could reduce Macron to being yet another President occupying the Elysee but severely constrained in his capacity to reform France — exactly the kind of President he said he wouldn't be.